One eye in the rear view mirror, one on the road, we set out one chilly evening in search of an ancient walled garden. Behind us, modern towers of Edinburgh’s waterfront recede into grey skies. Ahead glimmers a pale setting sun. But where exactly are we going? Granton Castle walled garden ‘the oldest undeveloped garden in Edinburgh’, perhaps the oldest walled garden in Scotland, has been here for more than 500 years, but Google Maps can’t quite locate it. It won’t be a secret for much longer. 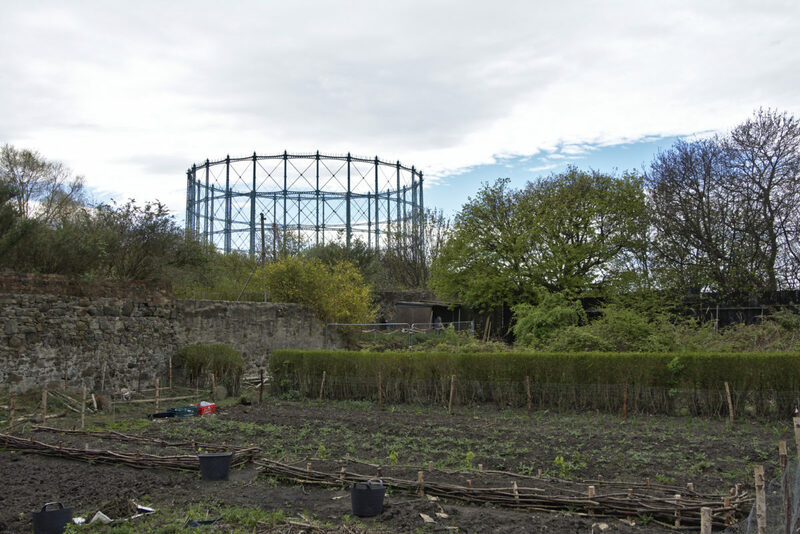 There’s another landmark appearing on the ground beneath the grand old Granton Gasholder which will help draw attention to the work of an energetic team bent on restoring the hidden garden to its former glory. 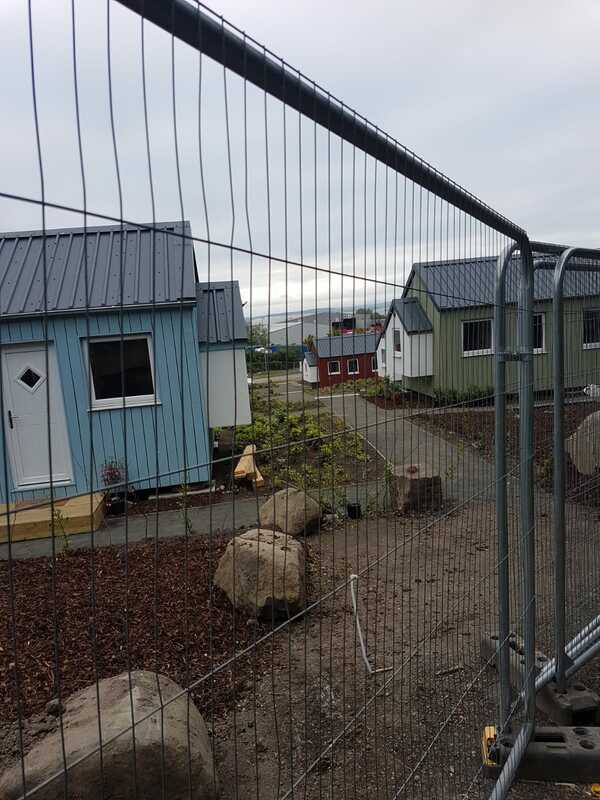 Right next door, overlooking the Forth, there’s the newly launched Social Bite Village a proudly bold pioneering project offering a new start for homeless people. 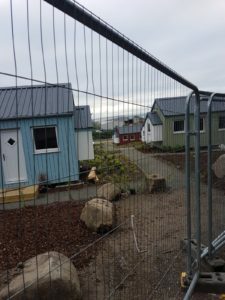 Long before we find the old walled garden we see the neat rows of brightly painted cabins. Lupins by the front door already in bloom and waiting to welcome the first residents. As it happens we coincide with guided tours of the new development. But (tempting though it is) we are not here for a discreet nosey into the hugely enterprising scheme launched by Social Bite’s Josh Littlejohn. That’s for another day. And when we find it, what a treat. Through a gate into a hidden space. Like all ‘Secret Gardens’ this is a magical place though it takes a childlike imagination to see through the undergrowth. 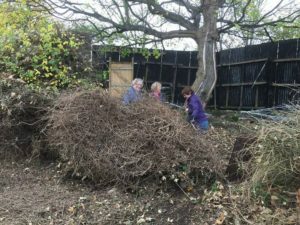 Teams of volunteers are heroically clearing ground clogged with brambles, nettles, and docks which rampaged in when the last owner left the site in 2004. This year there are 23 community gardens in patches of green space across the city – ‘sometimes small hidden gems, sometimes large and well known city landmarks’ – all of them preparing to open for food events on Saturday and Sunday 15 and 16 June. That fits World Kitchen in Leith aims perfectly (WKiL launched on Leith Links during the 2009 Leith Festival with the simple aim of ‘intercultural friendship through food and fun’). Without hesitation, we joined the ranks of groups offering to take part in events in local community gardens. 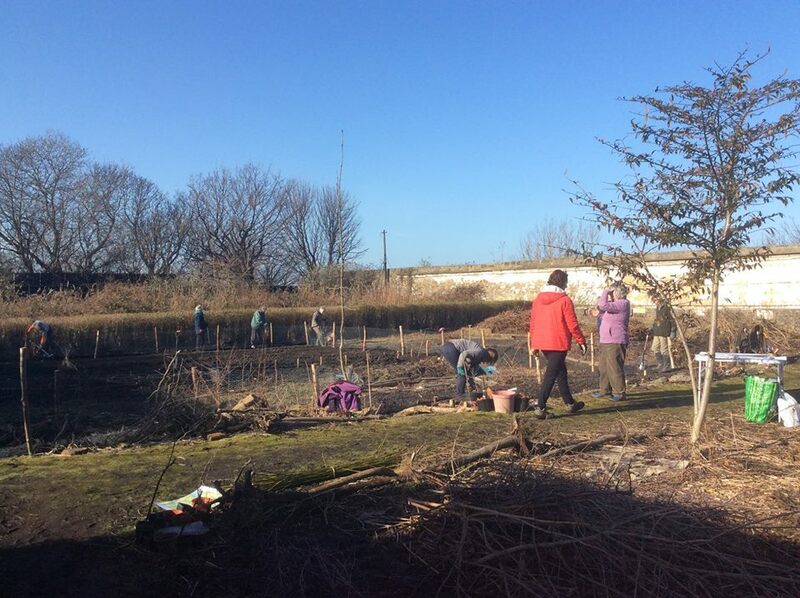 Kirsty Sutherland, of the Friends Group, also saw a match between WKiL and Granton Castle walled garden – so many of their volunteers are new arrivals in North Edinburgh and they come from all over the world. Kirsty contacted us straight away. Which is how we came to be here on a chilly spring night. Standing by the display boards showing a vision of the future, we are wondering what to cook. Future visions are enticing – visitor centre, community cafe, kitchen garden, heritage orchard and very much more – but the WKiL menu will require a little imagination for our Power of Food picnic. Only a small portion of the two acre site is under cultivation so far. However, old roses and young apple trees are flourishing in freshly turned ground. And gooseberries and raspberries are already producing fruit along with beetroot, chard, leeks, herbs and garlic. We leave with thoughts of strawberries and rhubarb combating the chilly winds off the Firth. From now on WhatsApp messages and emails between WKiL and the Friends Group will be about summer fruit and savoury finger foods. ‘Gooseberries are getting fat on the bushes from the rain,’ emails Kirsty. And what about green wheat flat breads with spicy fillings…. On the way back to Leith, waterfront tower blocks loom on the horizon. The jagged skyline symbolising Edinburgh’s uneasy compromise between heritage and modern development. Behind us lie the newly B listed walled garden and the Social Bite Village. Side by side they sit beneath the old B listed Granton Gasholder, islands of enterprise in the brownfield landscape of a post industrial era. Together they are visions of what can be achieved when people with ambition work together. Perhaps the rearview mirror offers a hopeful glimpse of the way ahead? 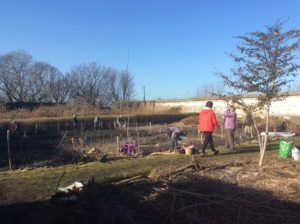 For more information: Friends of Granton Castle Walled Garden and World Kitchen in Leith are on Facebook. Power of Food Festival is too of course.